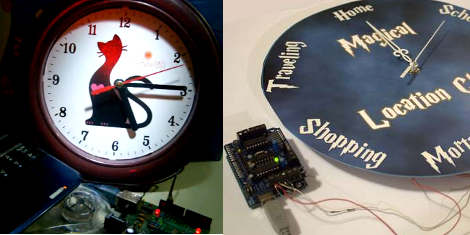 Here’s a couple of clocks that use Arduino boards to control inexpensive clockworks. The concept is quite simple, and perhaps best outlined by [Matt Mets’] article on the subject. As it turns out, these clockworks are driven by a coil, forming a device that is quite similar to a stepper motor. If you solder a wire onto each end of the electromagnetic coil and hook those to a microcontroller, you can alter the speed at which the clock ticks. Just drive one pin high and the other low, then reverse the polarity for the next tick. The clock you see on the right (translated) is a store-bought cheapy. The Arduino barely visible at the bottom of the image is sending pulses once every second. But as you can see in the video after the break, holding down a button will fast-forward through time. [Sodanam] posted his code as well as pictures of the hardware hack itself. To the left is a horse of a different color. It’s a clock modeled after the Weasley household clock from the Harry Potter books. The clockwork trick is the same, but the Arduino uses GPS data and NOAA weather information to set the status. ← Turn your Wireless Keyboard into a MAME Controller! I should mention the processing is done on the computer and pulses are sent out to the Arduino. I’m working on some better google lattiude code as reverse geo coding isnt all that its cracked up to be. That sure is a thing, all right. Neat! How does he protect the arduino ports from the reverse EMF spikes? The usual parallel diode trick won’t work if you’re reversing the polarity every tick. The diode trick does seem to work (although I’m like you, it feels suspect. I’m using a motor driver shield which is considerably more forgiving. I love it! The first thing that comes to mind is making any clock into a sidereal clock for astronomy buffs. You could have a clock whose hour hand points toward the current position of the moon. Lotsa possibility here! Tides too. Even us landlubbers are affected by our other orbital body, the moon. Build a radio, tuned it to WWVB. Pass its signal to the Arduino for interpretation. Update the clock’s time setting based on interpretation. Repeat. WWVB is out, and not getting any easier to receive and decode properly nowadays on account of the radio noise, especially if you live in a city. I’d rather use a GPS: that would make a very, very, very precise clock. I originally started one as a weather condition meter.. it would pull the current conditions and point to “cloudy”. I needed it because i worked in a basement and kept getting surpised with snow in the winter. Tons of possibilities. I was thinking it would be cool for a bug counter. First idea that came to me after reading this article: make a clock, where each tick has a random jitter but still keeps the time. Now this could be an annoing clock, if you have loud one. Heh, I did this with a Forebrain microcontroller board. It introduces a random jigger of up to half a second. The result you wouldn’t normally notice during the day, but my god don’t try to sleep with it in your room – it will cause you to sleep uneasily and randomly wake up during the night. BTW, time was kept by resoldering the original wires that drive the coils to a GPIO pin on the microcontroller, allowing you to re-read in the correct number of ticks, and use that to adjust the tick rate to keep time just as well as the original unmodified clock. Oh yeah, I should also mention that the clock’s winding is essentially a single pole motor, and you can cause the clock to tick backwards if you adjust the tick timings! I’m curious to know: What the point would be of introducing random jitter into an analog clock? Also, left and right are swapped in the image vs. the text. This is great for work, when you want to go to lunch a little earlier, then have the clock tick slower afterword to rematch real time. Has anyone considered using a cheap watch mechanism as a DIY servo? It seems that when they are made the shaped metal core where the rotor sits is polarised in one direction to introduce a directional bias. This is how the “reversed clock” trick works, you swap the piece over so it is upside-down. The trick here would be to degauss just the metal part then apply a constant low level DC current to the drive coil in either one direction or the other to set the direction of rotation. I tried this once. No matter what I did, the clock would gain or lose a few seconds every day or so. My rig had a bi-polar coil driver and was disciplined by a GPS receiver’s PPS output. I tried a lot of different variations on the driver circuitry – but the clock would still drift a little. I think you mean the one on the left. tibor-vavra liked CNC wine bottle engraver, plotter and cutter.